The Premier Calendar Road Race Series is made up of events around Britain where the best riders in the country race over distances up to 120 miles whereby each rider doesn't only have to battle with their rivals but also the tough countryside and whatever the weather may throw at them over a race that can last more than four hours. The 2006 series was won by Kristain House. Overall winner of the first Premier Calendar event for 2007 was Chris Newton who won the Bikeline event ahead of Robin Sharman and leader at the start of the day, Ian Wilkinson. 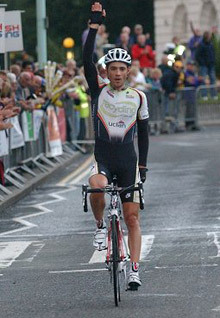 Winner of the final stage was Dean Downing, winner already of stage 2. He finished ahead of Robin Sharman, Rapha teammate Giancarlo Checchi. The second round of the 2007 Premier Calendar series, the Tour of the Reservoir, saw a great battle on a brilliantly sunny but windy day. Andrew Kenedy was on the back of a motorbike in the thick of the action to capture the race for us. He's done a fascinating photo report for us with some stunning images. Simon Gaywood was a delighted and worthy winner of the Archer GP where he triumphantly took the latest round of the Premier Calendar ahead of Matt Talbott and Andy Roche. British Cycling has hundreds of pictures from the event to go with the report and results that reflect the pain the riders went through on a hot day in Buckinghamshire. 29 April, East Midlands International CiCLE Classic, Leics. The 2007 East Midlands International CiCLE Classic has been won by Malcolm Elliott (Pinarello) at the end of a gruelling 100 miles around the lanes of Leicestershire. With the 160 rider field tackling some of the roughest and toughest lanes in the area around Oakham and Melton Mowbray, it came down to a 12 rider group sprint with Elliott winning the contest ahead of Ian Wilkinson and Michael Skelde in third. The Lincoln Grand Prix was, as it always is, a special race and this year more than most because there were so many riders in the front group who could have won it. In the end Dean Downing won the race and if ever there was a win born out of ‘a hunger to win’ it was this. British Cycling spoke to the riders on the podium and also a well known face and voice on the race, Roger Hobby to add to the report, results and hundreds of photos. Russell Downing (HealthNet-Maxxis) was today's winner of the Richmond Grand Prix, the seventh round of British Cycling's Premier Calendar series. Downing rode into the finish 20 seconds ahead of second placed rider Dave Clarke (BC Private Member), with third placed Gordon McCauley (PlowmanCraven-Evans) a further 24 seconds behind. Russell Downing won the Beaumont Trophy the latest round of British Cyclings Premier Calendar series after a four man sprint in front of a huge crowd at Stamfordham, Northumberland. Downing together with Malcolm Elliott, Chris Newton and brother Dean Downing had prised themselves off the front of the race after catching a break that included Matt Stephens on the last lap. The Ryedale GP, sponsored by Grasscrete, was won today by Chris Newton after 115 miles around the lanes of North Yorkshire. Newton was part of a small group of three that escaped with still 50k to go and from that, he countered an attack by Matt Stephens, and despite Russell Downing making a huge effort to get him back, Newton held on to win by a few seconds as he crossed the line in the historic Duncombe Park. The Blackpool Cycling Festival reached a thrilling climax on Sunday lunchtime when the massive bunch of 100 riders led by Paris-Roubaix winner Magnus Backstedt (Liquigas) stormed down the South Promenade to contest a sprint finish. Tour de France finisher David Millar was the winner of the Welsh Grand Prix in Abergavenny. Under a scorching sun, Millar and Daniel Lloyd were the strongest riders in the race and in the sprint for the title, Millar was too experienced and strong for Lloyd. Gordon McCauley was third. He has been looking for a win all year and in the final race of the series, Kiwi Gordon McCauley celebrated his call up for New Zealand at the World Road Championships with a victory in the final Premier Calendar event of the season. The other big winner of the day was Chris Newton who secured the Premier Calendar Series.